It’s time to pop in that favorite mixtape of songs you love! 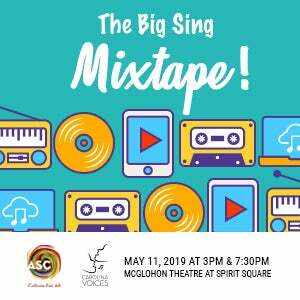 Sing along with Carolina Voices’ MainStage Choir as we cover all the best tracks – from The Beach Boys & The Beatles to Cyndi Lauper, ABBA, Richard Marx, & even songs from The Greatest Showman! Joining us onstage will be the thrilling dancers from Northwest School of the Arts! So crank up the volume and get ready to sing all your favorite tunes!